On Tuesday the 15th of January children walked past the third floor bathroom as the door was wide open. Students were peering in and sneaking a peak at what was inside. Occasionally a student or teacher might even stop to get a picture. Both students and teachers were looking on in awe at what they saw, Jose Santana, resident security officer at the 46 campus, vaping in the third floor bathroom. Santana was not merely vaping for recreational use, he was part of an hour-long CNBC documentary that is about vaping amongst teens in America. 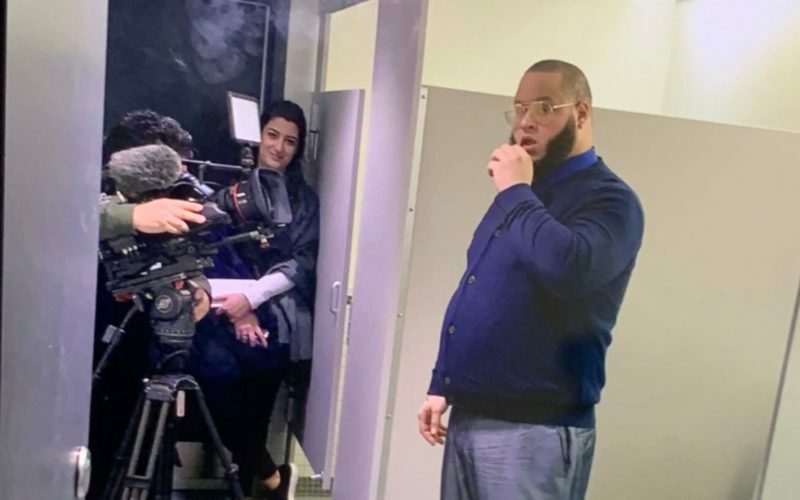 Grace as a whole will be featured in the CNBC documentary, because the crew at CNBC showed particular interest in the vape detectors that were installed in the bathrooms almost a year ago. Grace was one of the first schools in America to install vapor detectors in the bathrooms and the school received a lot of press for their trailblazing action against vaping. The CNBC crew was made up of seven filmmakers, including a cameraman, a sound technician, a few producers as well as on air reporter Carl Quintanilla. The team shot footage of students walking through the halls and filmed Santana testing the vape detectors in the bathroom. The team filmed Rob O’neill, Maintenance Staff, installing the detectors and Santana was recorded blowing a rip of the vape into the vape detector. The filmmakers were interested in how the system dealt with a detection of vapors in the air. After a vape detector is triggered, an alert is immediately sent to the security team and several members of the administration. The filmmakers filmed the whole process as well as an interview with Mr. Davison, Head of School, about Grace’s stance toward vaping and how the detectors factor into Grace’s policy. Grace will be a small part of the hour-long special that will most likely premiere in late March or early April on CNBC’s “Primetime,” so keep posted to your TV to catch Grace and Jose Santana this spring. We are interested in your take on the vaping sensors. Leave a comment below or email wsimotas@gcschool.org with your thoughts.